Aug. 17, 2017, 8:54 a.m. Whereas the left half of our spectrum is filled with many media sources from center to left, the right half of the spectrum has a substantial gap between center and right. The core of attention from the center-right to the left is large mainstream media organizations of the center-left. The right-wing media sphere skews to the far right and is dominated by highly partisan news organizations. Benkler fiddled with a laptop to show me how this looked in practice. He pulled up an image of a messy blue and red scribble against a white background. On closer inspection, this turned out to consist of thousands of tiny dots. Each represented at least one article in their database and was shaded red or blue to indicate the political association of its readers. The more times a website’s article was shared on Facebook, the bigger the dot grew. This meant you could determine at a glance whose articles were shared most often. Looking at the blue parts of the image, nothing was surprising: The largest circles were CNN and The New York Times, each shaded pale blue to indicate a center-left association. But the other side of the image showed just one big red circle: Breitbart. It was three times the size of Fox News and maybe a dozen times larger than any other news source on the right. If you wanted to know who was driving the Republican agenda in 2016, you didn’t need to look much farther than the massive crimson orb parked on Benkler’s screen. The center of gravity of the overall landscape is the center-left. 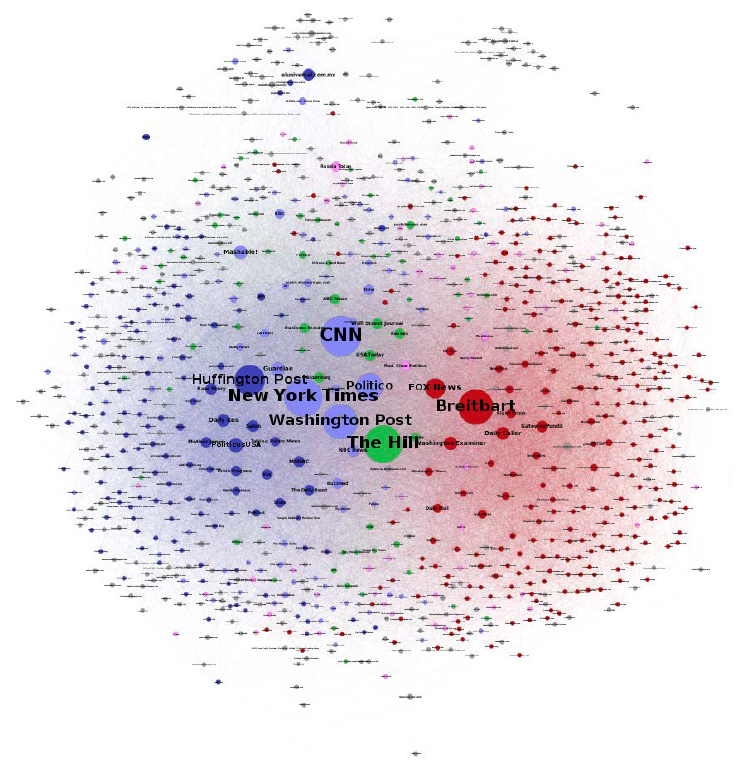 Partisan media sources on the left are integrated into this landscape and are of lesser importance than the major media outlets of the center-left. The center of attention and influence for conservative media is on the far right. The center-right is of minor importance and is the least represented portion of the media spectrum. Traditional media accountability mechanisms — for example, fact-checking sites, media watchdog groups, and cross-media criticism — appear to have wielded little influence on the insular conservative media sphere. Claims aimed for ‘internal’ consumption within the right-wing media ecosystem were more extreme, less internally coherent, and appealed more to the ‘paranoid style’ of American politics than claims intended to affect mainstream media reporting. The institutional commitment to impartiality of media sources at the core of attention on the left meant that hyperpartisan, unreliable sources on the left did not receive the same amplification that equivalent sites on the right did. Owen, Laura Hazard. "“The center-right…is the least represented portion of the media spectrum”." Nieman Journalism Lab. Nieman Foundation for Journalism at Harvard, 17 Aug. 2017. Web. 18 Apr. 2019. Owen, Laura Hazard. "“The center-right…is the least represented portion of the media spectrum”." Nieman Journalism Lab. Last modified August 17, 2017. Accessed April 18, 2019. https://www.niemanlab.org/2017/08/the-center-right-is-the-least-represented-portion-of-the-media-spectrum/.